Trading Miller: What teams make Ryan Miller’s no-trade list? Trade talk surrounding Ryan Miller has never been hotter as the Sabres begin to enter a rebuild and the potential to gain a handsome return for the former Vezina Winner. Acquiring valuable assets for the goaltender has become a hot topic as many question if he will return after his contract expires next summer. What stands in the way of dealing Miller is his limited no-trade clause. Miller is able to provide a list of eight teams that he will veto a trade to, thus limiting Darcy Regier’s options. In addition, the impressive glut of quality goaltenders around the league could further limit trade partners for the Sabres. I assume that Regier would try to avoid a similar situation to what played out with Jarome Iginla – steering the Flames towards a trade with Pittsburgh due to his no-trade clause – and simply obtain Miller’s list of eight prior to pulling the trigger on a deal. Providing the player latitude on where he wants to go will ultimately reduce the available return in a trade, Regier wouldn’t let that happen. However, which teams might appear on that list may be difficult to determine.I figure there are three basic groupings of teams that you can pick teams from when considering the list of teams Miller wouldn’t accept a trade to. Keeping in mind that he is in more of a “win now” mode with an expiring contract, his specific interests may be geared towards perennial contenders and avoiding teams that are in the process of building. Winnipeg: Although the Jets have a rabid fan base, Winnipeg doesn’t seem to be the most desireable place to go. When you consider Miller may have interest in getting closer to his wife in LA, Winnipeg isn’t much of an upgrade. Also consider that Winnipeg just signed Ondrej Pavelec to a lengthy extension last year. Lock. Edmonton: The Oilers have a boatload of young talent but also share the rugged, blustery winters that Winnipeg deals with. In terms of attractive places to live, Edmonton and Winnipeg probably rank at the bottom of Miller’s list. Lock. Calgary: A team that is worse off than the Sabres, Calgary has sold off major parts of their core and are in full rebuild mode. They likely won’t be anywhere close to contending when Miller’s contract is up next year and won’t provide Miller with a true chance to win. Lock. Colorado: While the Avs, like the Oilers, have plenty of young talent, they’re still struggling to become a contender. As a team that appears to still be a few years out, I don’t see them as a team that would offer Miller a true chance to succeed. Lock. New Jersey: Probably closer to a lock than a bubble at this point, the Devils are an average team with two aging goalies. While they will desperately need a solution in goal, Marty Brodeur holds the cards on that decision. Until he retires they probably won’t be in the market. Combine that with their poor play, I have the Devils as a strong bubble team. Florida: Despite winning their division last year, the Panthers are still working to retool various portions of the roster. In addition to having phenom Jakub Markstron waiting to take over, the Panthers don’t appear to be a club that would provide Miller a true shot at the Cup or a lucrative extension beyond next season. Between Markstrom and that time line they could be a lock, but I’ll say bubble for now. Dallas: Like the Panthers, Dallas has a high draft pick waiting to make his pro debut (Jack Campbell). They also appear to be retooling a great deal of their roster. As a team that still needs a couple of years to come together, it doesn’t seem like a good destination for Miller. Place them in the same bubble category as Florida. Phoenix: Without any ownership issues I’d bet the Coyotes would be a very attractive option for Miller. Dave Tippet coaches a responsible system and makes goalies look like superstars. If there is a light at the end of the tunnel this summer, and Mike Smith hasn’t been re-signed, I could see Phoenix as a potential destination. Until they they’re on the bubble. Philadelphia: A goalie graveyard that has sunk to the bottom of the East thanks to below average goaltending and poor defense. Probably not the type of town Miller would want to walk into. That being said Philly’s commitment to winning and overall talent level keeps them on the bubble. Columbus: The Blue Jackets are beginning to look like the Islanders and Oilers in a way. They’ve made strides to improve and the results are showing on the ice. However I feel like they still may have a stigma as an unattractive place to play, no matter how off-base that may be. I could see Miller holding them to that same standard for the time being. Bubble. New York Islanders: Evgeni Nabokov has been great this year and may help lift a talented roster into the playoffs. Nabokov is aging and a UFA this summer all while the Isles are growing into a contender. However, they play in a bad venue and won’t be moving for two more years (aka after Miller’s contract is up). Charles Wang isn’t afraid to pay goalies but does Miller see them as a true contender in the East? Bubble. That makes 12 teams which would need to be pared down to eight by Miller. My logic puts Calgary, Colorado, Edmonton and Winnipeg on without question and I’m willing to bet New Jersey and Dallas wouldn’t be far behind. Those six seem like safe bets while an easy argument can be made for Columbus, Phoenix, Florida and the Island. As to exactly which teams do and don’t make the cut will be up to Miller. Another wrinkle in this saga is the fact that there will be an entirely different list of teams outside of Miller’s eight who won’t have much interest in the goaltender. By my count there are 13 teams who either have a cornerstone goaltender under contract or have a highly touted prospect waiting to take over. Some have both. The Bruins, Canadiens, Canucks, Hurricanes, Kings, Panthers, Penguins, Predators, Rangers, Red Wings, Senators, Stars and Wild all fall into this category for me. Only the Panthers and Stars are among the teams I consider to be options for Miller’s no-trade list. Considering that, there is a potential for upwards of 20 teams who wouldn’t be in the market for Miller this summer. While that still leaves 10 teams for the Sabres to negotiate with, it is certainly a much smaller rolodex to work through as Regier attempts to bring in new assets. 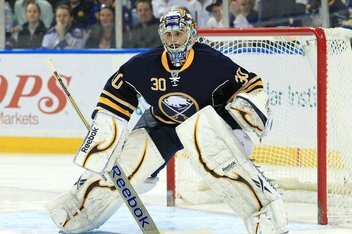 Next Article Trading Ryan Miller: Who will be looking to buy?